Random Ramblings of a Demented Doorknob. : 50/50 Review #12: City Lights. 50/50 Review #12: City Lights. My first experience with Charlie Chaplin was last year with the fantastic Great Dictator, which I count as my "half second" silent film, since it's only partially a silent film, and I'd only seen one prior to that. My full second was The Artist about a month ago. So now we're back to Chaplin again for what is my third full silent feature, as well as being what is considered one of his best films. We center on a Tramp (Charlie Chaplin), who saves an eccentric billionaire (Harry Myers) from killing himself one evening as he's drunk. They "befriend" each other, though the billionaire only remembers the tramp when he's drunk. He also meets a blind flower girl (Virginia Cherrill), with whom he almost immediately falls in love with. The tramp is then tasked with finding a way to get money to pay for a new eye operation that will allow the blind girl to see--but at the risk of losing her when she sees him and realizes he's not a rich man, but just a tramp. What I love about Charlie Chaplin is his creativity. Every scene is a new gag, while at the same time moving the story forward. And every gag works and is very clever and funny. Everything feels almost like a martial arts film due to how finely choreographed everything is, but I'm talking a Jackie Chan flick where everything is rather comical and "purposefully sloppy," I guess you could say. I'm always amazed at the routines pulled off and how exact the timing had to be. The story here is a simple one, but a good one nonetheless. There's the very sweet relationship between the tramp and the blind girl, and a strange, but interesting "friendship" between the tramp and the billionaire. I was actually kind of surprised at some of the darkness of the story and some of the places it went. When I think Chaplin, I think more whimsy (even with Dictator). So when I get suicide attempts, drunken tomfoolery, and a bit of gun play, I was a wee bit shocked. If I had any problems, they were small and few and far between. The biggest that sticks out in my mind being that some of the gags go on a little too long and feel repetitive. Did they need to fall in the water three times and have the same exact reactions and outcomes all three times? Things like that. But, again, it was only here and there. On the whole, I think I'm becoming quite a fan of Mr. Chaplin and will seek out some other works of his, most definitely. I might even branch out and watch a few more silent flicks of other varieties. But mostly Chaplin for now. I always seem to have a lot of fun with his flicks and never fail to have a smile on my face while watching. He's just so... charming and fun. I do love this film dearly. I agree that a few of the gags probably overstay their visit, but it's a minor problem in a film I love. 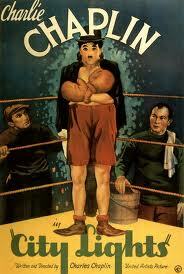 Out of the Chaplin films I've seen this is my favorite. This is one of my favourite films ever - how cool was it that I got to watch a whole lot of Chaplin films when I was studying for my Drama exam? Fun times. I think the end is just perfect. I feel like shedding a tear every time I think of it! Glad to hear that you enjoyed it. I was a little worried about this one. It's one of my favorite movies, but I do see your point about some of the repetitive comedy. There are some great sequences, and the ending is classic. Everyone talks about how they *loved* that ending. I can understand why. I really liked it, but I didn't fall in love with the ending like everyone else. Not yet, anyway. You've got some Keaton coming up, and liking Chaplin bodes well. Keaton is my favorite of the silent comedians, and I think you'll like him, too. His style is different, but no less entertaining. When I went looking for recommendations for classic movies for my current project, this one popped up a few times. I'm a bit wary of silent movies, just because I miss the dialogue, but after reading this I'm looking forward to seeing this when it pops up on my schedule. Alan: Chaplin stuff is a lot of fun, even without the talking. Hope you like it! V.G. Movies #16: House of the Dead. 50/50 Review #15: Le Samourai. V.G. Movies #15: Resident Evil. The Vlog: Season 4 "Demented" Commentary. The Demented Podcast #38 - Steve Effs Off. The Knobbies #3 - Winners! 50/50 Review #13: His Girl Friday. V.G. Movies #13: Lara Croft: Tomb Raider. The Demented Podcast #37 - Fairy Tales.